This is a great running option, just a couple of miles east of Berkeley. Many refer to to this 2,079 park as the jewel of the East Bay Park System. There’s Lake Anza, a botanical garden, wonderful wildflowers, and extensive trails. 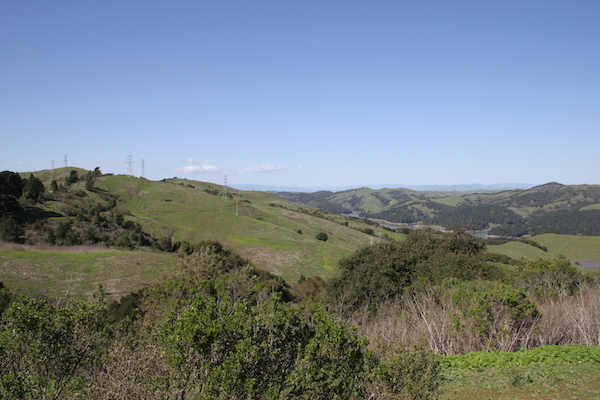 The most popular trail for running is the 4.1 mile Nimitz Way trail, which follows the ridge between Wildcat Creek and the San Pablo Reservoir, with great views of San Pablo reservoir, SF bay and Mt. Diablo. It is ~300 foot elevation gain, average grade of 3%. There are mileage markers. Wildcat Canyon. Lovely, open trail running, just north of Tilden Park. Good views. Hilly.